Safari Spas welcomed its first guests in 2003 with a goal of creating a truly exceptional luxury experience for residents in Red Deer and Central Alberta. Our team visits luxury spas all over the world in an effort to continually improve what we do. We want our guests to feel like they are on a mini vacation each and every time they visit. Our customer surveys tell us we hit the mark on a very consistent basis! Come relax in our beautiful spa, where we’ve created a deluxe environment: everything from glass mosaic and Italian tiles, fireplaces, frosted glass, lighted mirrors and extra plush chairs. 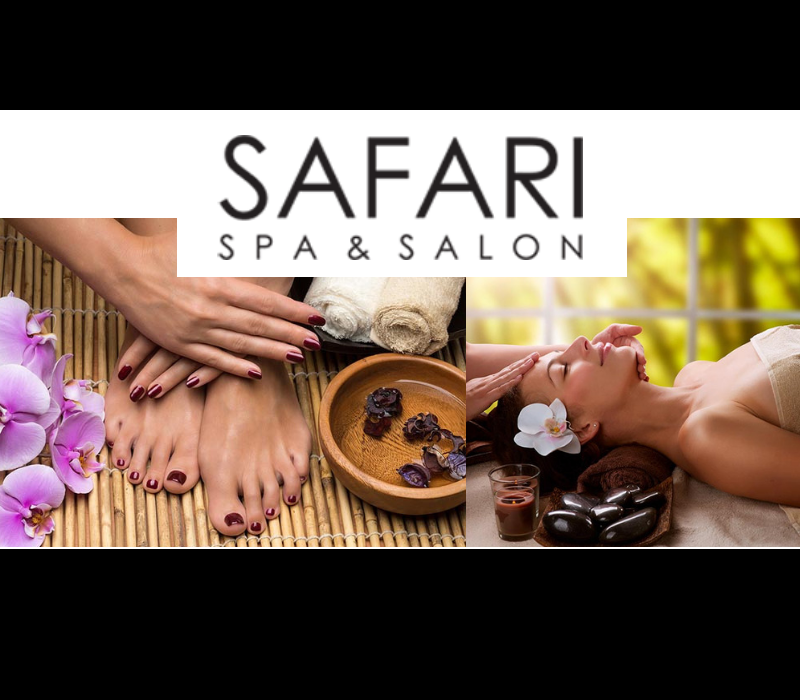 Safari Spa & Salon offers massages, facials, manicures, pedicures, body wraps, body polishes, aromatherapy, waxing, and hair styling for men, women and children, among other services. Our level of service is over the top. We cater to our guests at every turn. We have created an experience within Red Deer that you would expect at a resort spa. It’s all about helping you recharge your batteries, getting your body, mind and soul back into alignment. We have a staff of 45, including four managers who ensure your experience is always 5 star. As long term members of our team, they care for the business as if it was their own. Janelle has been with us since we opened. Chana started as a hair stylist and is now an integral part of our management team. Heather and Natasha are newer to the team and are our Customer Service gurus, always taking care of every little wish and desire of our guests. We are very proud of our deep roots in this community and support many worthwhile organizations and events. Of particular note is our annual Red Deer Festival of Trees, supporting the Red Deer Regional Health Foundation. We’ve been an active sponsor of this amazing community event since we opened in 2003. We offer a variety of sublime services in a luxurious environment. Click to take a virtual tour. We are proud to be the only AVEDA Lifestyle Spa in the region. Shampoo and Style, 60 minute Chakra massage, 90 minute customized facial, Aveda Spa manicure and pedicure. This is the perfect way to spend a relaxing day together. You will each receive a one hour relaxation massage, men’s spa facial for him, customized Aveda facial for her, then enjoy a spa snack and refreshment while sitting next to each other experiencing spa pedicures in our whirlpool pedicure spa chairs with fully adjustable heated massage chairs. Complete luxury in a serene atmosphere. This ultimate package includes: 1 hour relaxation massage, aromatherapy body wrap, customized Aveda facial, spa manicure, and spa pedicure. Relax in our serenity area and enjoy. Complete treatment for the body. One hour relaxation massage, spa facial, body polish and shampoo & style. Sixty minute customized facial, 60 minute hot stone massage, pedicure, shampoo, condition and style. Get pampered from head to toe with our customized Aveda facial, spa pedicure and one hour relaxation massage. A mini sampling of the spa experience. This package includes a customized Aveda facial, spa pedicure and spa manicure with paraffin wax. This package is created for the special man in your life. One hour relaxation massage, men’s spa facial and a spa pedicure. Stress can really take its toll on your physical and spiritual health. Try our French Lavender infused Stress Fix Massage, pedicure and manicure to help reduce everyday stress. This is for those deserving to be pampered. Included in this package is a spa pedicure, spa manicure and one hour relaxation massage. Browse some photos and please click here to learn more about Safari Spa and Salon. We are located in Unit 100, 31 Clearview Market Way, Red Deer. Please contact us through email clearview@safarispa.com or phone 403.314-9628. We are open from 9:00am -3pm on Good Friday, Victoria Day (May), Canada Day (July 1) and Heritage Day (August). We are open from 9-5 on Christmas Eve so you can start your Christmas celebration off right. Getting ready to celebrate the New Year? We have you covered from 9-5 on New Year’s Eve. We open at noon on Remembrance Day so that we, along with our guests, can attend services throughout the region. Please visit and let us spoil you soon!